1 10.050 Levi, Jordan All Olympia AOGC 2018 Lights, Camera, Action! 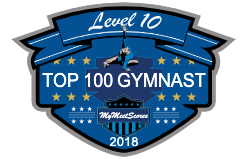 11 9.975 Walker, Chalyn All Olympia AOGC 2018 Lights, Camera, Action! 21 9.925 Wright, Sekai American Gymnastics Academy of Long Beach 2018 Lights, Camera, Action! 50 9.875 Perez, Miriam All Olympia AOGC 2018 Lights, Camera, Action!